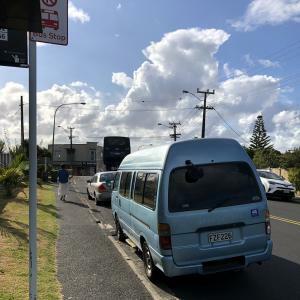 Bus stop 4138 outside 62 Rangatira Rd has a campervan (with out of date rego) parked within 1m of the bus stop. This was causing buses difficulties to stop and end up blocking the road as they can’t pull in to the side. This is always happening as there’s no painted bus stop on the road unlike other bus stops along Rangatira. Please can we have painted lines on road? Also need to ping a few vehicles for rego round here!